The ancient Egyptians believed that mummification was essential to a good afterlife. Well, we’ve got a recipe that will ensure you’re living your best life, right here right now. Here, you’ll be roasting a sumptuous half chicken until it’s as golden and glistening as a pharoah’s treasures. And like the perfectly preserved bodies of kingdoms long past, this one comes with stuffing (although ours has apples, cranberries, and pieces of baguette). Wash and dry all produce. Adjust oven rack to middle and upper positions; preheat oven to 450 degrees. 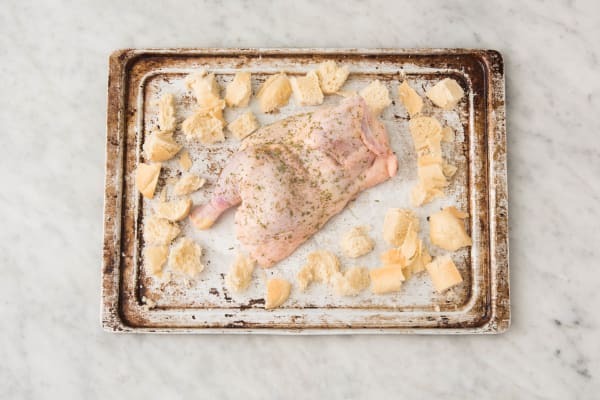 Place chicken skin-side up on a baking sheet. Sprinkle with 2 tsp harvest spice (we sent more), salt, pepper, and a drizzle of oil; rub in to moisten. Tear 1½ baguettes into roughly ¾-inch pieces. Place on same sheet (use the rest as you like). Place sheet in oven. Let roast until bread is crisp and golden, 6-7 minutes. Remove baguettes from baking sheet and set aside. Return chicken to oven on middle rack and roast until no longer pink in the thickest part of thigh, 35-45 minutes. Meanwhile, halve, peel, and dice onion. 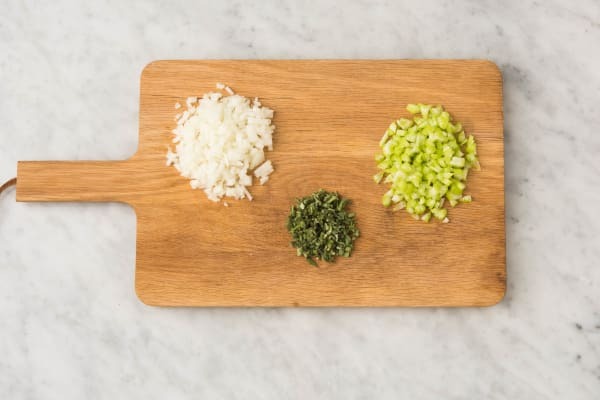 Finely chop celery. Pick and chop sage leaves until you have 1 TBSP. Heat a drizzle of oil in a small pan over medium heat (use an ovenproof pan if you have one). 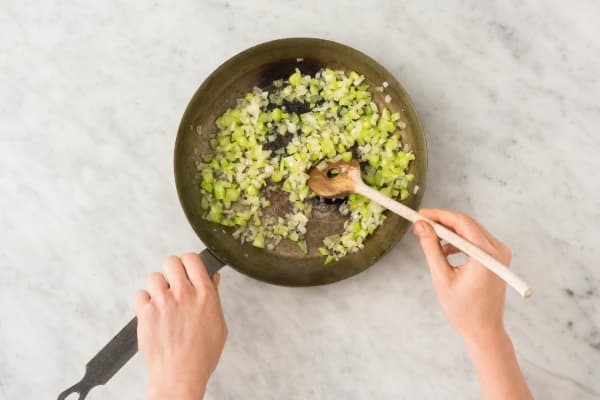 Add onion and celery. Cook until very soft, 6-8 minutes. Season with salt and pepper. Toss in 1½ TBSP butter, chopped sage, and remaining harvest spice. Cook, stirring, until butter is melted and herbs are fragrant, about 30 seconds. 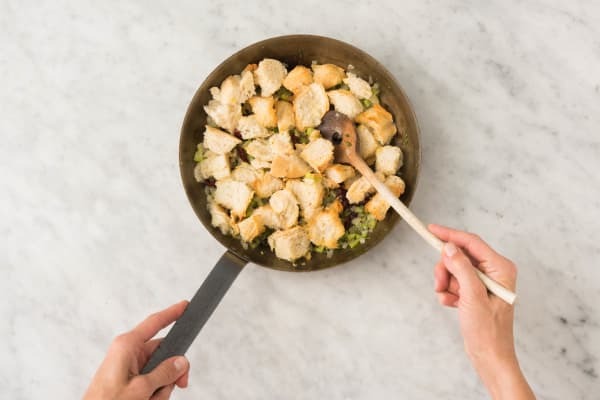 Add baguettes and cranberries to pan and toss to combine. Stir in stock concentrates and 1 cup water, tossing so that liquid is absorbed. Season with salt and pepper. Cover with foil and bake in oven on upper rack for 15 minutes. TIP: Transfer everything to a baking dish first if your pan isn’t ovenproof. Toss green beans, a drizzle of oil, and a pinch of salt and pepper in a medium bowl. 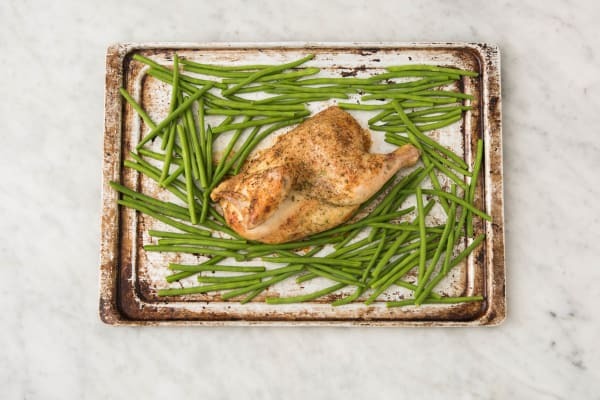 Spread out on baking sheet with chicken. Return to oven and roast until beans are tender and chicken is done, 10-12 minutes. Remove foil from stuffing and continue baking until crisp on top, 10-12 minutes. 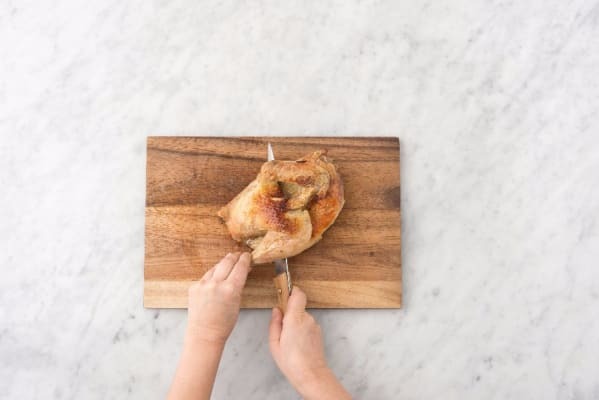 Let chicken rest for a few minutes after removing from oven, then slice between breast and leg to separate into two pieces (halve breast and divide leg to give everyone both white and dark meat). 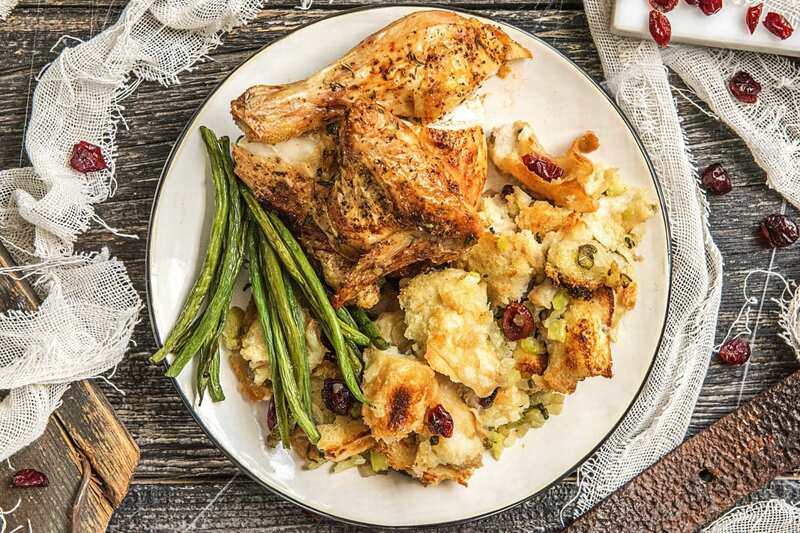 Divide stuffing, green beans, and chicken between plates and serve.